This edition of Star Warz is dedicated to the UK-based Metalheadz label, founded by Drum ’n’ Bass-legend Goldie. Thanks to his energetic dj-sets for pirate radio Centreforce, Randall’s breakthrough took place. In 1994 he worked together with Andy C for the "Sound Control ep", which became a huge Drum ’n’ Bass classic! Randall has already played at big festivals like Helter Skelter, Dreamscape and World Dance. So we’re delighted to see Star Warz added to this list. Randall will be accompanied by Marcus Intalex, without a doubt a name that sounds very familiar. If not, we’re giving you the chance to come and discover him. Intalex is 50% of the "MIST"-duo. This duo exists since 2001 and they know like no other how to satisfy the drum ’n’ bass scene. Intalex’ most famous work up to now is the astonishing "How you make me feel EP", which appeared on Doc Scott’s label 31 Records. Another Drum ’n’ Bass talent we have invited is Seba. This Swedish producer has already released records on Looking Good records and Paradox Music. His in 1999 founded Secret Operations label does have a lot of success. Bailey is a musical wizard with a record collection that will make you turn green from jealousy. 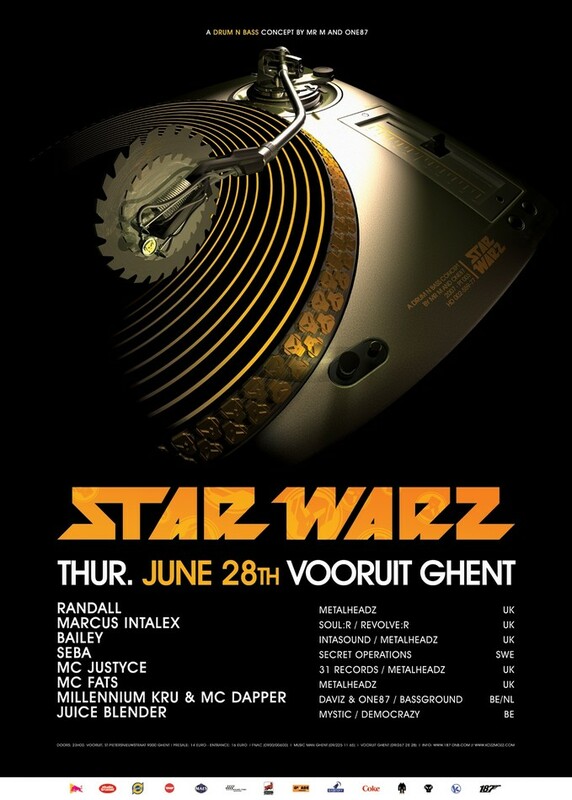 The reason why he’s resident for Metalheadz, will become obvious on the next Star Warz! Off course we can not forget our Belgian artists. Juice Blender, now solo, has been present in the past and will join us again! Off course our residents Millennium Kru will also be present and this time with their new mc, MC Dapper. We all know that MC’s play a very important role in the Drum ’n’ Bass scene. This time we have the honour to present you MC Justyce. This MC already toured with Doc Scott and on stage he can be frequently found in the companionship of Goldie and Roni Size. Last but not least, there’s MC Fats, he is resident for the Eastside True Playaz parties, Metalheadz en the London-based Fabric. He’s specialized in stirring up the crowd and we’re convinced he will do the same at Star Warz. Be prepared!